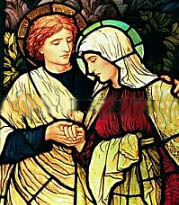 "When Jesus saw his mother and the disciple there whom he loved, he said to his mother, 'Woman, behold your son. Then he said to the disciple, 'Behold, your mother.' And from that hour the disciple took her into his home." When we began the Friends of St. John the Caregiver in 2005 we couldn't find any saint listed as the "official" patron for those who take care of a spouse, aging parent, a child or sibling with special needs, or a friend or family member, but we couldn't think of a better choice than the caregiver Christ chose from the cross for his own mother. of a photograph of a stained glass window.